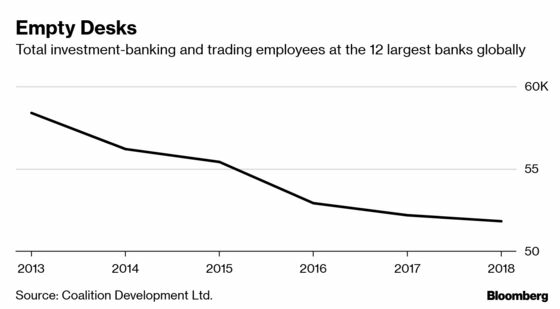 (Bloomberg) -- Automation and new technology are replacing thousands of workers at banks and asset managers around the world, just as consolidation -- including Deutsche Bank AG’s proposed merger with Commerzbank AG -- puts thousands more jobs at risk. The pressure on headcount follows bouts of volatility that roiled global markets late last year, and investors’ growing preference for passive, low-fee funds that require far fewer workers at asset-management firms. On top of that, financial companies with operations in the U.K. could slow their hiring ahead of the country’s anticipated exit from the European Union. Traders may be on high alert for cutbacks after a tough first three months of 2019, which usually marks investment banks’ best quarter of the year. UBS Group AG Chief Executive Officer Sergio Ermotti last week called it “one of the worst” first-quarter environments in recent history. The inversion of parts of the U.S. yield curve, considered a harbinger of recession, is adding more dark clouds. Still, shrinking staff is an annual tradition for the biggest securities firms, which trim personnel in some areas to expand in others or dismiss under-performers to make way for an incoming class of junior bankers. The yearly sweeps don’t necessarily signal plans to shrink businesses. In 2018, the 12 largest global investment banks cut front-office headcount for at least the fifth straight year, industry data firm Coalition Development Ltd. said in a report last month. JPMorgan Chase & Co. is dismissing hundreds of workers in its asset and wealth-management division as part of a periodic review of staffing levels. Nomura Holdings Inc. is planning to cut dozens of jobs across its trading and investment-banking businesses in Europe and the U.S. as the brokerage struggles to make a profit overseas. Deutsche Bank and Commerzbank are in talks to combine in a merger that could put as many as 30,000 jobs at risk. Goldman Sachs Group Inc. is considering plans to reduce its core trading business in the fixed-income group, including at least 10 workers in its commodities unit. The firm told New York State in February that it will eliminate 65 jobs, blaming “economic” factors. Standard Bank Group Ltd. expects to close 91 branches across South Africa, most by the end of June, in a move that may affect about 1,200 employees. Absa Group Ltd. is restructuring its South African retail and business-banking unit within months of reducing the division’s management team. Union representatives have said 827 jobs could be at risk. Standard Chartered will cut expenses by 2021 in a streamlining plan that may include trimming jobs in Singapore, the Business Times reported. London Stock Exchange Group Plc disclosed plans to cut around 5 percent of global headcount. Dianrong, a Chinese peer-to-peer lender backed by Tiger Global Management and Standard Chartered Plc, plans to cut as many as 2,000 employees as it tries to reduce costs and comply with authorities’ efforts to shrink the industry. Laurentian Bank of Canada said it will cut its workforce by 10 percent after posting earnings that missed estimates for a third straight quarter. Some 350 employees will lose their jobs. Societe Generale SA is drawing up plans to eliminate jobs at its investment bank, and could cut hundreds or even thousands of positions at its global banking and investor-solutions unit. HSBC Holdings Plc will trim at least 50 jobs in its global banking and market unit as part of an annual performance review of its staff. Legg Mason Inc. plans to cut staff as it increases investment in technology to manage assets. BlackRock Inc. is cutting 3 percent of its global workforce, or about 500 employees, the largest reduction to its headcount since 2016. State Street Corp., the giant custody bank and asset manager, has started trimming its senior management ranks by 15 percent. AQR Capital Management, the quant manager, is cutting jobs after a dismal performance in 2018. The reductions will amount to a low single-digit percentage of the workforce of about 1,000 employees. Banco Santander SA’s Polish unit announced plans to reduce its workforce by 11 percent, or as many as 1,400 jobs. Morgan Stanley dismissed some of its under-performers, with cuts occurring throughout fixed-income, equities and research divisions. CaixaBank SA’s formal talks with unions will begin in April, with the company proposing 2,157 job cuts.